As part of the graduated driver's license (GDL) program, the Arizona Motor Vehicle Division (MVD) requires you to either take a driver's education course or complete supervised driving practice before applying for your graduated Arizona driver's license. If you complete an Arizona Driver's Ed course, the AZ MVD may waive the behind-the-wheel portion of your driver's license test. Arizona Driver's Ed includes both in-classroom instruction and behind-the-wheel driving instruction with an approved supervisor. When can you take Arizona Driver's Ed? Be at least 15 years old and 6 months. Pass both written and vision tests. For more information, please visit our Applying for a New License (Teen Drivers) in Arizona page. Don't Forget Your Practice Test! We all know that practice makes perfect. Prepare yourself for your written exam with an Arizona practice test, and pass on your first try! How Long is an AZ Driver's Ed Course? Once you have your Arizona graduated learner's permit, you can begin your behind-the-wheel practice either with your parent or with a trained instructor (see “Types of Driver's Ed Courses in AZ" below). Since a driver's education course teaches not only the basics of your vehicle and Arizona driving laws, but also gives you valuable defensive driving tips and hazard prevention methods, many parents and teens choose to utilize the benefits that an approved Driver's Ed course provides. 6 hours of behind-the-wheel driving instruction (with a certified instructor). Before applying for your graduated AZ driver's license you should study the AZ driver manual. NOTE: If you have a valid out-of-state driver's license, you do NOT need to satisfy the AZ driver's education, driving practice, and learner's permit requirements. Certified public high school driver education program. 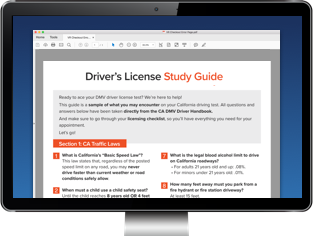 It is important not to confuse Driver's Ed with traffic school or defensive driving schools, which are taken by those who have received traffic tickets and driver's license suspensions. Be at least 16 years old but under 18 years old. Have held an Arizona learner's permit for a minimum of 6 months. 20 hours during the day. NOTE: If you didn't complete an Arizona driver's education course, your parent or legal guardian must certify that you have completed the behind-the-wheel driving requirement in writing. For more details about applying for your graduated license in Arizona, please visit our page about Applying for a New License (Teen Drivers) in Arizona.